Washing your windows consumes a great deal time and energy? You can make a change now – simply get in touch with our operators and book our window cleaning in West Brompton. We will handle this nuisance for you and the final result will be ideal for each part of your windows – glass surfaces, framework and ledges. With our assistance, you will have the flexibility to do anything you desire with the time you usually spend for window cleaning. But our services will bring you even more, as you can see from our list of benefits. We also provide our professional services in nearby areas: Earls Court, Kensington, Chelsea, Parsons Green, Fulham. You can always depend on our workmanship and commitment for domestic and business window cleaning. Our abilities allow us to clean all types of windows you could possibly have as part of your property. For instance, you can apply for cleaning of small or double windows, sash ones, French doors, bay windows and patio doors. In addition, we include greenhouses and roof windows as part of our routine. So to speak, you can fully enjoy the good look of your windows with our swift and reliable services. With our experience and workmanship, the good look of your property will be accomplished immediately – the specialists of commercial window cleaning will manage with this matter. We use water-fed extension pole system for speedy and effective window cleaning, up to the fourth floor. For office buildings taller than the forth floor, we use up-to-date rope access tools. With our gear, we can reach the highest glass panes, even on the skyscraper-sized buildings London is known for. From small shops to towering business edifices, we ensure second-to-none services – call, now! We use progressive techniques of window cleaning to make sure you will have excellent end results. With our water fed pole system, high pressure cleaning and rope access equipment, you can be sure that your property's windows will be sparkling. Furthermore, your property is in good hands – the cleaners are completely insured and thoroughly trained. The water fed extension poles are connected to water supply vans, while our rope access pledges for safety – even when we clean high-rise buildings. You can benefit from these methods immediately – dial 020 3746 3113! 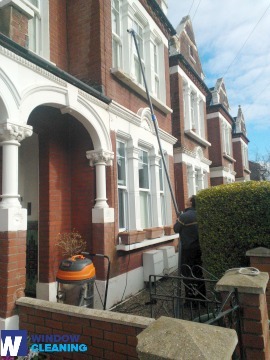 Hire us for window cleaning in West Brompton for your house. We will use the same techniques – water fed extension pole system for lower windows and rope access tools for taller buildings. For the whole service we use purified water. Request a service today – ring 020 3746 3113 and speak with our call centre staff. Or just fill in our online booking form or use our chat feature.